First Selectman Jim Zeoli and Selectman Mitch Goldblatt are among the volunteers at the annual Lions Thanksgiving Dinner. The members of the Lions Club of Orange will host their annual Thanksgiving Dinner the first Sunday after Thanksgiving, Nov. 25. The dinner is open to everyone but their target guests are the town’s elders, shut-ins, and all those in need of good food and fellowship. Entertainment during the event is provided. 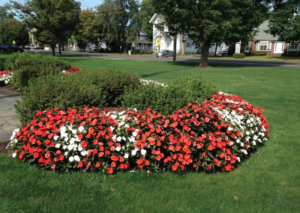 For more information, call Joan Cretella at 203-891-4786. Transportation can be provided by the Community Services Transportation program. Call the Transportation Coordinator, Kim Callahan at 203-891-4788 to arrange a ride. 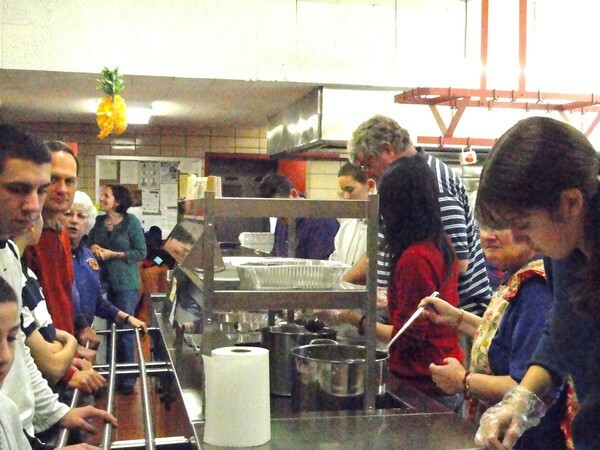 The Orange Lions Club Thanksgiving Dinner was a huge success. On Sunday the Orange Lions Club hosted its 26th annual Thanksgiving Feast welcoming the town’s seniors and others who may not have family with whom to share the holiday. The High Plains Community Center gym was full, with a record crowd of about 150 guests this year (that’s 20-30 more than in past years for whatever reason). The Lions were ready for them with 16 beautiful roasted turkeys (perfectly moist and tender); trays of sweet potatoes and stuffing; dozens of festive cookies and cupcakes from Julia’s Bakery; dozens of pies and lots of love. The entertainment they lined up for the event ran non-stop throughout the meal. First, a talented young pianist, then the Orange Senior Choir, followed by a guitarist. The Lions and the community volunteers were happy to provide everyone with a lovely, relaxing afternoon with a nutritious meal and entertainment. 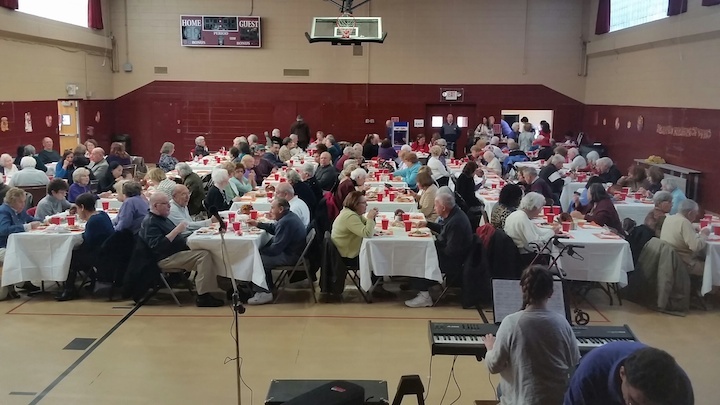 They will be back again in 2015 for the 27th annual Thanksgiving Dinner. Get Uncorked Wine Tasting: Buy Your Tickets Now! Around Town, Charity Events, Home, Latest News Comments Off on Get Uncorked Wine Tasting: Buy Your Tickets Now! The Lions Club hosts a couple of fabulous fundraisers each year to help provide for their charitable giving. As in the past, this popular occasion offers a wide variety of fine wines, boutique beers, specialty cocktails, hors d’oeuvres, desserts and a raffle and silent auction with wonderful prizes. Get Uncorked will take place at St. Barbara’s Greek Hall, 480 Racebrook Road from 7 to 10 p.m.
Tickets are $35 per person, and are available at www.orangeCTLIONS.org, Racebrook Wine and Liquor or by calling Lions Marianne Miller at 203-795-3906 or Maria Sandilo at 203-641-8003. The 2011 Basket Brigade volunteers posed for this group shot. On Saturday morning dozens of volunteers from Orange and other communities will meet at Champs Direct Printing & Mailing, 75 Cascade Boulevard in Milford to take part in the annual Basket Brigade to assemble food baskets for families in need in New Haven County. Orange resident Glen Ketchian has participated for 15 years. Last year he told me all about the organization. Founded by self-help author and success coach Tony Robbins, The Basket Brigade is built on a simple notion: one small act of generosity on the part of one caring person can transform the lives of hundreds. It takes only one light to dispel the darkness and even just one basket or a few, to bring hope. A Basket Brigade takes place when one individual prepares one basket to personally deliver to a needy family or individual. The Connecticut chapter was established 19 years ago by two of successful businessmen with the desire to help others, and put together about 30 food baskets for needy families that first year. By the time Glen Ketchian joined 15 years ago, the number had grown to 50 families. Four core members, Ketchian (President, LRK Communications Inc) his father Lionel (President of LRK Communications and the Founder of the Happiness Club) John Sottery (CEO of a software company in Milford) and Victor Frazao (owner of an Insurance agency in Bridgeport) continue to feed the hungry at Thanksgiving, using monetary donations and volunteer help, on Saturday they put together more than 500 baskets which will be delivered to the families on their lists by Saturday night. Families of eight or more receive two baskets. Sottery said the group gave away more than 20 tons of food over 18 years. It will take a few minutes for about 200 volunteers to form an assembly line and fill each of more than 500 plastic laundry baskets for families in New Haven County, with canned goods, a roasting pan, rolls, cake mix, a box of Bigelow Tea, stuffing and a pie. The other 500 plus baskets for Fairfield County will be assembled in Trumbull this year. The completed baskets are brought outside and lined up in rows of five where they can be counted once and then a second time making sure there were enough extras so that each delivery person had at least one discretionary basket in their vehicle. When they were delivered, each family will also receive a bag of toys — usually coloring books and crayons — and a 14 lb frozen turkey. If you would like to help assemble and/or deliver baskets on Saturday, Nov. 17, sign up at www.CtBasketBrigade.org, then join us at Champs Direct Printing & Mailing, 75 Cascade Boulevard, Milford at 9 a.m.
During 9:00 am to 3:00 pm, volunteers will assemble and deliver baskets of food and provisions to area families. Last year the CT Basket Brigade fed 500 families, this year, the group is hoping to feed 1000 families. In order to reach their objective the CT Basket Brigade is asking you to volunteer and donate some of your time or resources to a cause based on the simple notion that one small act of generosity on the part of one caring person can transform the lives of hundreds. The CT Basket Brigade accepts donations online via PayPal. A simple donation of $30.00 can feed one whole family, with one hundred percent of all donations going towards purchasing food and toys. Last year $14,770.53 was spent on food for the baskets.